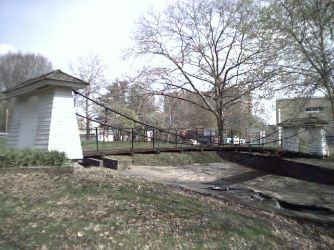 This Roebling Suspension Bridge is located in Mahlon Stacy Park, just north of the Waterworks, between Route 29 and the Delaware River. The bridge spans the waste weir which allows excess water from the Feeder of the Delaware and Raritan Canal to drain to the Delaware River. This is especially necessary during storms, to prevent the canal from overflowing its banks. This weir either flows as a trickle or a roar. 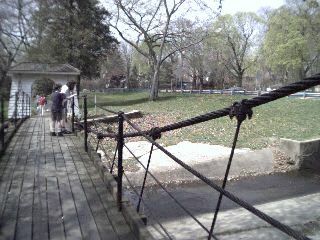 The bridge is a replica of the Brooklyn Bridge, and was presented to the City of Trenton by the Roebling family. 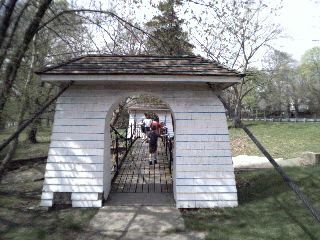 It is one of two Roebling Bridges in the City of Trenton. Two towers support the bridge. The Brooklyn Bridge towers are of stone, but these towers are of wood with painted clapboards and cedar shake roofs. The cables are anchored to concrete at each end. An arched wooden walkway sways with each step taken, thus the nickname "Shakey Bridge." To visit this bridge, walk past the Trenton Water Filtration Plant. The bridge is located at the edge of the plant. 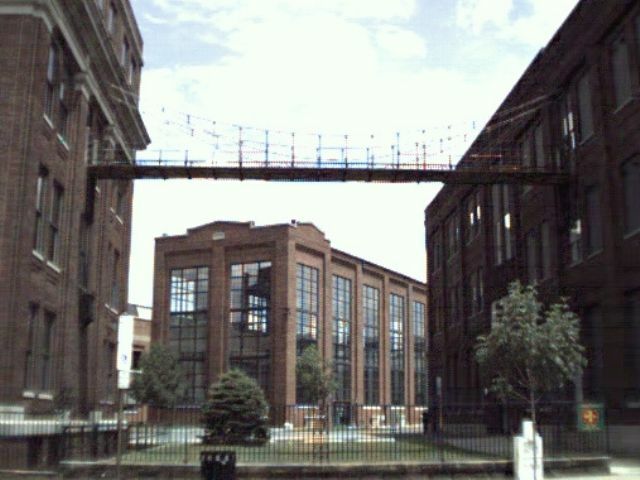 This bridge connects two buildings which were originally the Headquarters Offices of the Roebling Trenton Plant. They now house Mercer County Administrative offices. Behind the bridge is the Invention Factory, a museum.